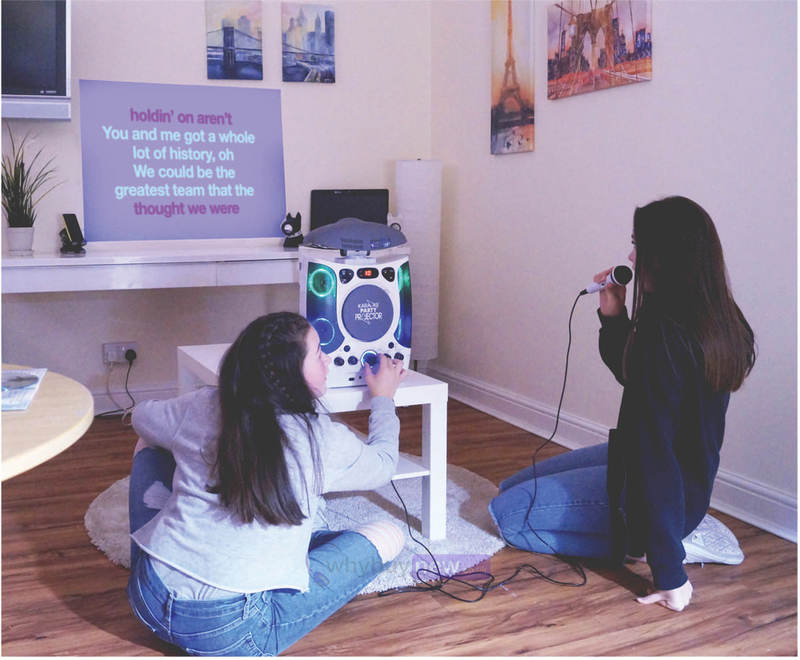 This Mr Entertainer CDG Bluetooth Karaoke Machine features built-in LED lights and an LED Projector that displays the song lyrics on a wall or screen. It comes complete with a wired handheld microphone and a 40 track CDG with the biggest hits from 2017. 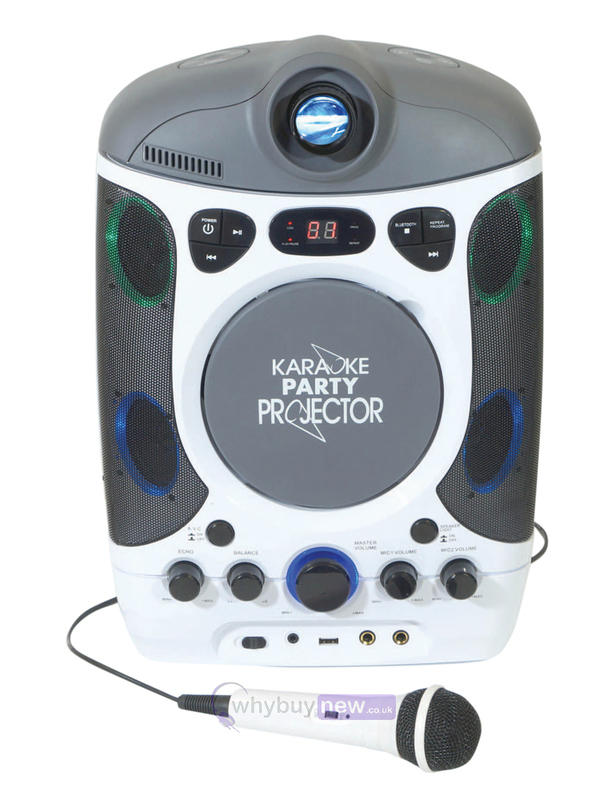 Not only does this karaoke machine stream songs from a Smartphone or tablet via Bluetooth but also features a USB input for MP3 and MP3+G files. 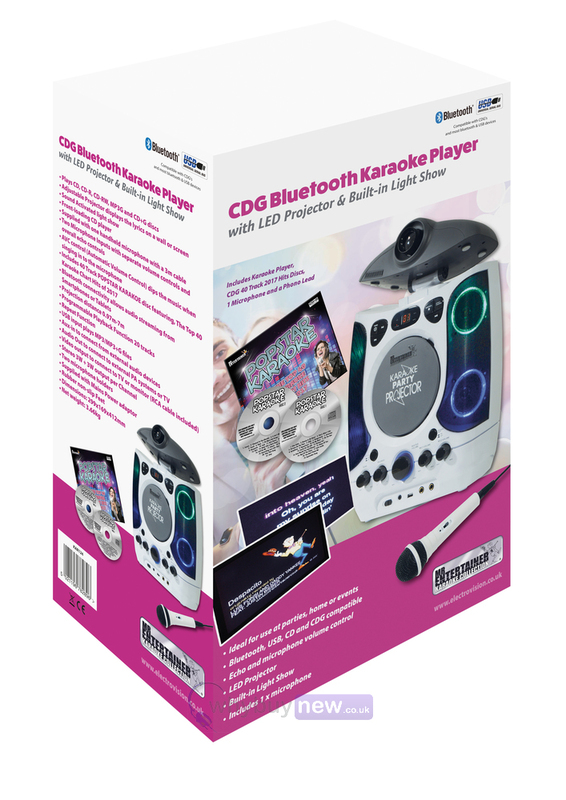 This Mr Entertainer front loading CDG Bluetooth Karaoke player is ideal for birthday parties, Christmas celebrations or even just a Saturday night at home with friends. 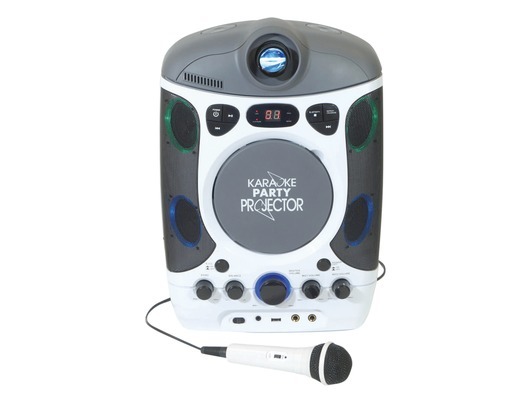 This exciting Karaoke machine features an adjustable LED projector to enable lyrics to be projected onto a wall or a screen. 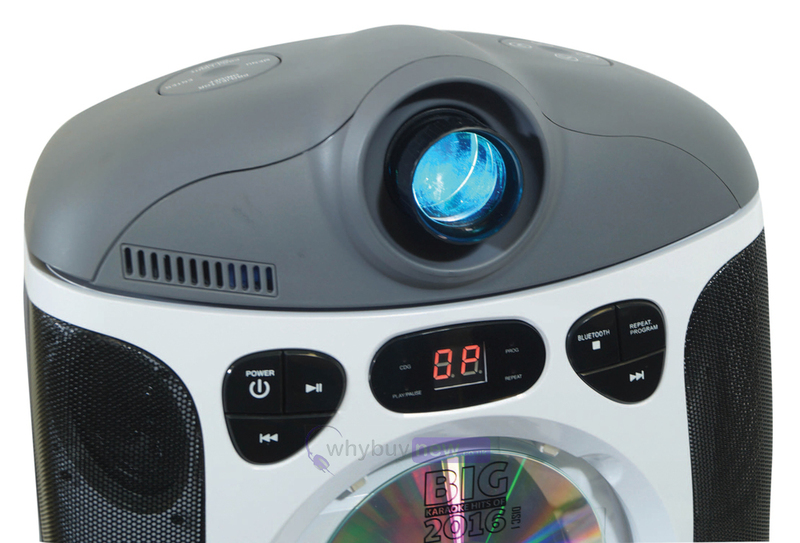 The projector has an adjustable focus lens in order to make the text clear and the colour, brightness and contrast can all be adjusted via an on screen menu. Here we have the Mr Entertainer CDG Bluetooth Karaoke Player with LED Projector in brand new condition and in B-Stock. The B-Stock versions would have been on display at a training evening or trade exhibition only and will come boxed in good cosmetic condition with all accessories and a 1-year warranty. 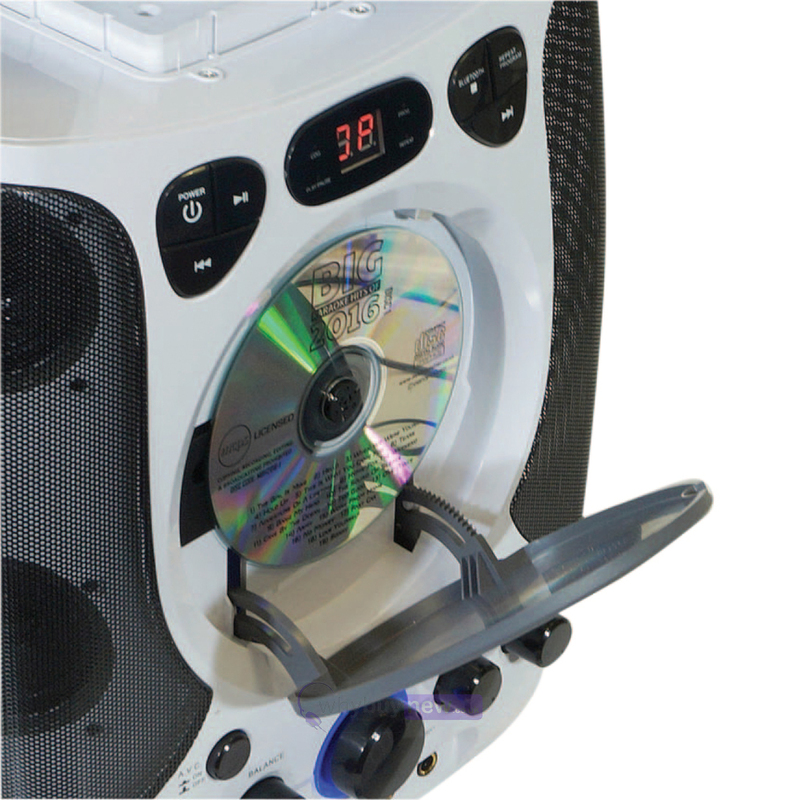 This karaoke player with handy rubber non slip feet can also stream songs from Smartphones or Tablets via Bluetooth. You can also connect the karaoke player to a TV set, monitor or projector via the rear video output. The audio can be enhanced by using a more powerful Hi-Fi system or PA amplifier for that stadium feel. Increase the fun and make all the family join in. It is also possible to connect other external audio sources via the AUX connector and play back audio content through the USB port. Supplied with one hand held microphone with 3m cable, two microphone holders and a mains power adaptor. The unit has two front-fitted 6.3 mm jack microphone inputs with volume controls, adjustable echo effect and an AVC function (Automatic Volume Control) which dips the music when you begin singing into the microphone.